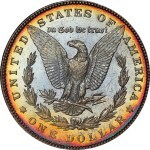 LAS VEGAS – Legend-Morphy Rare Coin Auctions recently held The Regency Auction IV in Las Vegas, the fourth under the “Regency” banner and fifth overall for the auction house. Numbers were exceptional across the board, with several noteworthy coins bringing well into six figures. The sale was once again held at the Bellagio during the PCGS Members Only Show, and huge online pre-bidding culminated with over three hours of feverish floor, phone, and online bidding, as a packed house battled over lots. Also for this sale, well known auctioneer Ron Guth returned to the podium at the request of Legend-Morphy partner Laura Sperber, setting the pace and calling the auction, which began at 6 PM PT. Legend-Morphy partner Dan Morphy “was more than pleased with the sale and results. Lot preview was very strong with nothing but positive feedback on the catalog. The 1893-CC Morgan Dollar PCGS MS66 Jack Lee smashed expectations, hammering at $161,000.00, and the 1883-CC $10 Gold Eagle PCGS AU58 EX Hall/Simpson exceeded estimates, bringing in $16,100.00. Many others went for well above expectations, and in addition to the highlights listed above, Legend-Morphy was thrilled to announce the 1831 Capped Bust Quarter PCGS MS65 CAC, which went for $26,450.00, the 1879-CC Morgan Dollar PCGS MS64 from the Rancho CC Collection which realized $18,975.00, and a 1826 Capped Bust Half Dollar PCGS MS64 which went for $7,475.00. 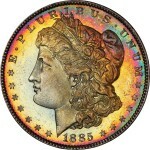 Laura went on to say that “the prices realized (many of which were record setting) proved that Legend-Morphy has as much fire power as any other rare coin auction house.” All prices realized are posted on the Legend-Morphy website: http://www.legendmorphy.com. The next Legend-Morphy sale, The Regency Auction V will be held Thursday, December 18 at the PCGS Members Only Show at the Venetian in Las Vegas. They are now accepting consignments. ** For information about consigning to Legend-Morphy’s December Regency Auction V or for more information on any lot in the sale, e-mail Julie Abrams at juliea@legendmorphy.com or call 717-335-3435. You can also follow Legend-Morphy on Twitter at http://twitter.com/LegendMorphy and on Facebook at http://www.facebook.com/LegendMorphy. Fakes – How can You Tell? Reproductions – Should You Buy? List Your Antique Business for Free! We invite all antique dealers, shows, auctions, flea markets and appraisers - whether you have a showroom or work out of your home - to take advantage of the Antiques.com free directory.